NVIDIA was the first to bring 3D Blu-ray (BD) via native HDMI 1.4 to the PC, coupled with HD audio bit stream support in the GTX 460, GTS 450 and GT 430 family of GPUs the home theater PC (HTPC) market has become much more interesting for the enthusiast. A few weeks back MissingRemote took a look at the GTS 450, and while it was a surprisingly good fit it is a little too much GPU for non-gamers. With 96 stream processors, a 128-bit memory bus and only 4 ROPs the GT 430’s hardware is unsuitable for more than casual gaming, but these limitations translate directly into lower power consumption and a format more suitable for use in a HTPC. There is a danger in removing too much hardware from the GPU, read on to find out if NVIDIA hits the HTPC sweet spot. The GT 430 review sample includes all the important connectors, including HDMI and DVI, in a flexible (full or low profile) configuration without the need for an additional PCI-e power connection. The reference card’s heat sink and fan (HSF) was quiet and worked well, but unlike many retail versions is not a true single slot card as the HSF overhangs the adjacent expansion slot rendering it useless. Unlike the GTS 450 previously reviewed, the GT 430 was able to use both the HDMI and DVI ports simultaneously to a HDMI 1.4 display and HDMI 1.3 audio video receiver (AVR) to enable 3D BD playback and HD audio bit streaming with a DVI-to-HDMI adapter. NVIDIA has a good history of supporting proper 24p (i.e. 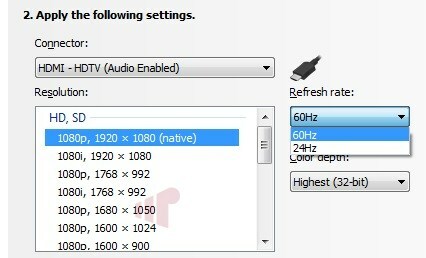 23.976 and 24.000 Hz playback) so while it is confusing that only 60 and 24Hz modes are listed in the NVIDIA Control Panel (NCPL) after connecting a 24p capable HDTV (either directly or through the AVR) to the GT 430; the 23Hz (23.976Hz) setting required for judderless playback is exposed by the driver to Windows. It is not unusual for the video driver configuration interfaces to hide some of the supported refresh rates, but it strange that such an important mode would be. 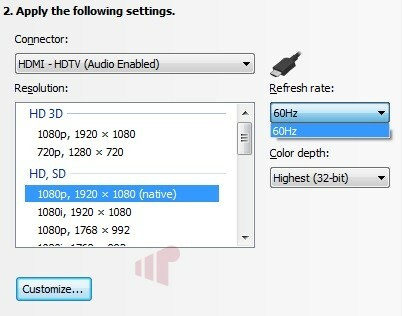 Perfectionists can create a custom resolution with 23Hz in NCPL, but for everyone else it does not make that much of a difference, only changing the method for selecting one of the more granular options manually: via the “Screen resolution” -> “Advanced settings” Windows provided option. Automatic methods (i.e. MPC-HC / DTB Addin) and hot-key solutions (i.e. ResChange) query the driver capabilities directly so they are unaffected. 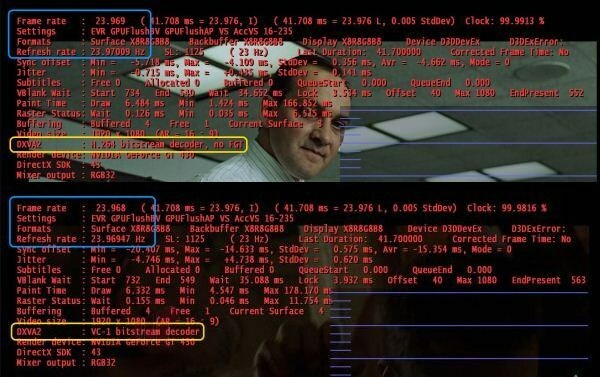 With 23Hz selected, an almost perfect frame rate to refresh rate parity (in cyan) was measured with MPC-HC–a FOSS (free open source software) DirectShow based media player. 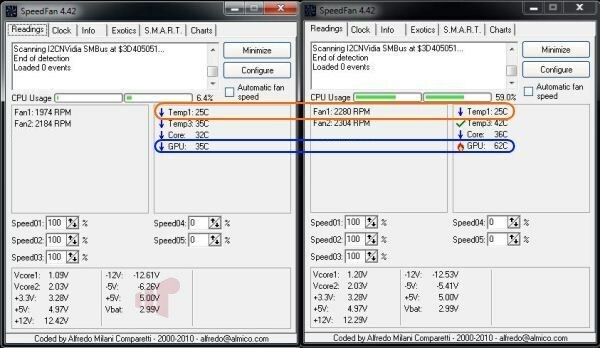 It is also worth noting, that for both of these screenshots, the native MPC-HC video decoder was used to provide hardware acceleration (DXVA2) for decoding the AVC/H.264 (top) and VC-1 (bottom) content (in orange) used to measure refresh rate; a significant bonus for FOSS enthusiasts. I love the added depth in experience that 3D provides to good content, so the NVIDIA GT 430’s support for frame sequential 3D Blu-ray playback is an essential feature for me. Some configuration is required to enable HDMI 1.4, and the feature works as advertised with appropriate software, but unfortunately the implementation is somewhat kludgey. As noted earlier the GT 430 supports proper 24p playback, but when 3D is enabled the driver no longer provides a 23/24Hz mode for 2D. So selecting 23Hz via any of the methods discussed earlier actually changes to 24p 3D. 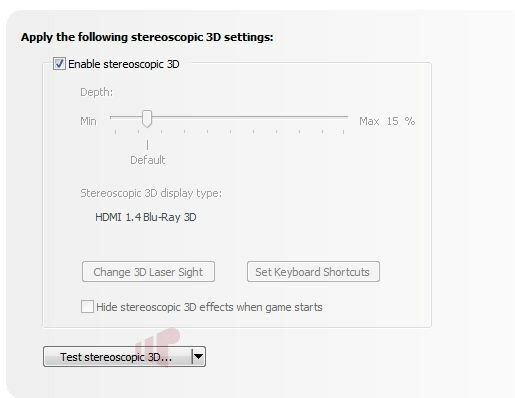 So some effort with the keyboard and mouse is required to enable 3D before and after watching a 3D title. 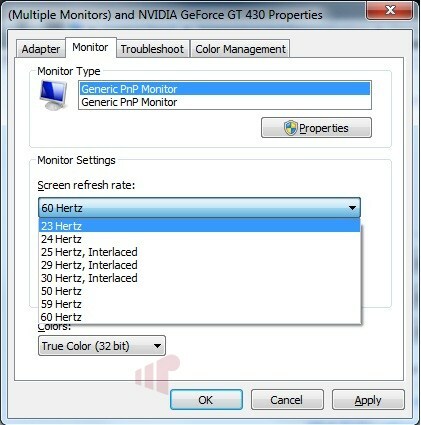 For those with an HDMI display, the GT 430’s default behavior for colorspace produced perfect video levels (16-235) results for file and disk playback in Windows 7 Media Center (7MC), ArcSoft Total Media Theater (TMT), Corel WinDVD (WDVD) and Cyberlink PowerDVD (PDVD) while also maintaining proper levels (0-255) for non-video content and passing blacker than black (BTB) and whiter than white (WTW) to aid in calibration. 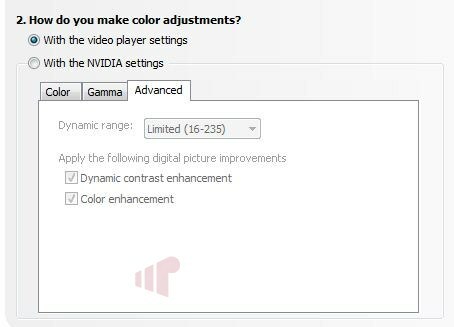 By default the driver uses RGB 4:4:4 12-bit, but YCbCr 4:4:4 12-bit is also available for those with a display that does not handle RGB input properly or sharing an input calibrated for that format. The story is very different for those with DVI only displays, where NVIDIA uses “PC” levels (0-255) for all content. TMT, WDVD and PDVD detect this and adjust accordingly for disc based content (BTB and WTW are clipped during conversion), but only TMT and PDVD also display the correct levels for file based content. 7MC users can apply a registry setting (HKLM\ SOFTWARE\Debug\ehPresenter.dll, “NominalRange”=dword:1) to correct for this, but I was unable to find a fix for WDVD. NCPL does provide an option to force levels, but I found that switching the value to anything but the default setting — “With the video player settings” — produced inconsistent results between players and content types so it is best not to change anything. Also an issue for those with DVI only DLP (or other displays that have overscan) is that the ability to resize the desktop seems to be broken in the current driver revision for that display type, it did function properly for HDMI. On the Samsung TV used for testing, the option was not even visible until adding the correct HDTV resolution. Adding it did not correct the problem however, because the utility would not launch after pressing the “Resize Desktop” button; also adding insult to injury, the driver would “forget” that the display was a HDTV between reboots. Like the GTX 460 and GTS 450, the GT 430 has audio feature parity with modern GPUs from AMD and Intel providing HD audio bit streaming support (other members of the 4×0 family do not support this feature). Unlike the GTS 450, I did not encounter any HDCP issues with the GT 430 review sample but the experience was consistent when it came to the other audio issues previously noted: including hot plugging HDMI cables requiring a reboot to work properly and where the audio driver does not maintain a persistent connection with the AVR. Usually the second issue only means that the first few seconds of sound could not be heard as the HDMI audio connection is reestablished, but also occasionally manifested as an issue where audio cannot be heard at all until switching to a different track. 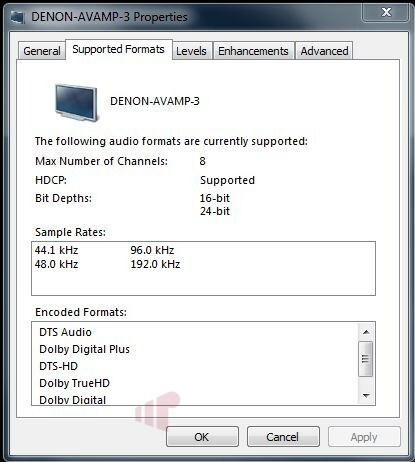 For those who use HDMI with multi-channel LPCM content, it is worth noting that the audio driver supports 5.1 and 7.1 configurations. Eight channel audio files played on a system configured in 7.1 output map each channel correctly, but six channel files played on a 7.1 configuration improperly map left/right surround audio to the left/right rear surrounds instead of the correct left/right side speakers. HTPCs serve many purposes; in system reviews we not only focus on the playback experience but also address overall media consumption which includes commercial scanning and transcode performance. As the hardware and software ecosystem matures to the point where GPU accelerated compute provides a tangible benefit to enthusiasts it is also important for us to include this aspect of the card’s performance in our reviews. To test the GPUs compute performance Cyberlink’s MediaShow Espresso 6 (a utility that can use NVIDIA/AMD/Intel GPUs to accelerate decoding/encoding video files) was used to transcode three approximately thirty minute recorded TV files using four different CUDA enabled NVIDIA GPUs as well as just the CPU in the test machine. Not surprisingly, the GT 430 is around 20% slower on average than the GTS 450 and faster than the other solutions providing a 28% average decrease in transcode time against the nearest GPU competitor (8600GT) and 76% versus the CPU; with the largest performance difference versus the CPU achieved with the most demanding file (1080i AVC), taking just over 21 minutes to convert. 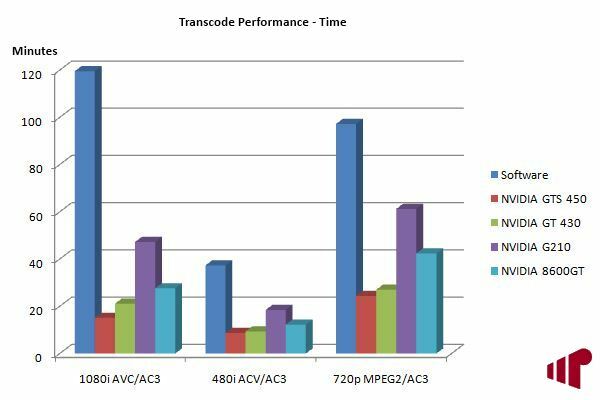 Looking at these performance numbers it is clear that GPU compute provides an easy way to get better transcode performance out of an aging HTPC. Taking a look at idle power usage it should first be noted that the “Software” value was generated with the GT 430 in the PC so the consumption numbers are equal (75W). The most interesting result to me from the test is that the GT 430 has the lowest idle usage of any of the cards, even the low-end G210, and a less than 1W on average difference versus the slower 8600GT during transcoding – all achieved in near silent operation. Before moving on, it is also worth noting that although the CPU method consumed less peak electricity (10W), the duration required using that method means that the total consumption far outweighs that difference. Taking a look at how the GT 430 impacted case temperatures in the modified Ahanix D4 MCE case (Fan1 = CPU / Fan2 = 60mm outlet) we can see that like the GTS 450, there was no measurable rise in case temperatures (confirmed with an IR thermometer). Besides a moderate increase in fan speed, utilizing GPU compute produced no negative impact in the PC. To access BD playback ArcSoft TotalMedia Theatre 3 and 5, Corel WinDVD 2010 and Cyberlink PowerDVD 10 were tested with the GT 430. Each of the three software solutions was able to perform GPU based video decoding, proper 3D BD playback, and bit stream HD audio (TrueHD/DTS-MA) with the latest updates installed from each vendor. The only issues noted were with 3D playback when two HDMI cables were in use: TotalMedia Theatre 3 would not transition to 3D mode properly and PowerDVD 10 would display an error but would transition and playback 3D BD properly. 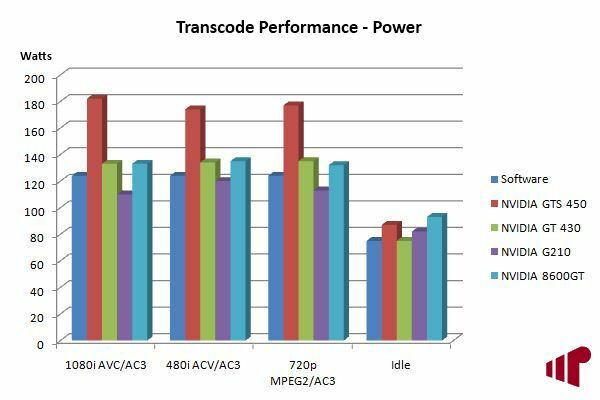 Video decode performance was measured with a series of physical BD and 1080p M2TS files containing AVC/VC-1 video and TrueHD/DTS-MA audio with the results captured in the table above. With each hardware capable decoder, including the free open source (FOSS) DXVA2 enabled MPC-HC decoder; it performed very well with no obvious playback issues. 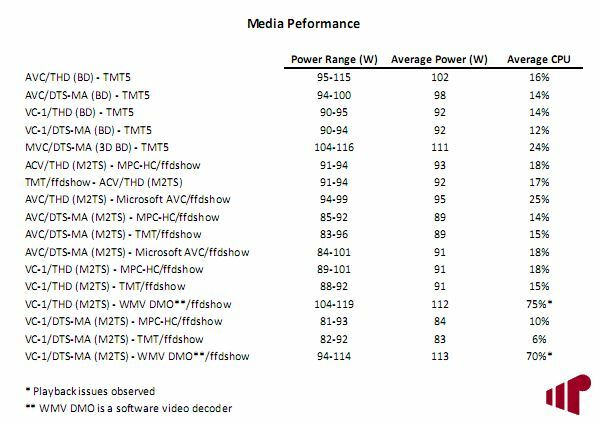 When evaluating HQV-HD scores it is important to remember that while numbers are produced, the outcome is still somewhat subjective so results should only be evaluated within the context that created them; in this case connected directly to a Panasonic TC-P58VT25. Given the GTS 450’s results (which were adjusted slightly versus what was originally published), I was not shocked by the Class 1 results where the GT 430 fails all of the cadence detection tests but 3:2 (AMD deserves some kudos here for being the only GPU that correctly detected each sample); but I was a little surprised by the overall score where the GT 430’s more consistent performance in Class 2 gave it a slight lead versus the more powerful GTS 450. Anyone interested in the full results, a PDF is available. HQV is a useful way to measure overall video performance, but it is important to understand the limitations of the test when it comes to real world performance. Looking at the screenshots above taken at approximately the same time from a 480i HD PVR capture (AVC/AC-3) we can see differences in the picture, but it is difficult to say which is better with each GPU struggling with deinterlacing and noise reduction (although the AMD 5550’s color seems a little off and softer than the others) in a what is arguably a worst case scenario (highly compressed, low resolution, interlaced sports programming). With efficient idle and peak power consumption, impressively quiet operation, full hardware acceleration – available commercially and to the FOSS community – for video playback alongside an unmatched feature set at a very reasonable price ($50-$80 street), the NVIDIA GT 430 is an excellent option for the dedicated HTPC and still the only choice for HDMI 1.4. 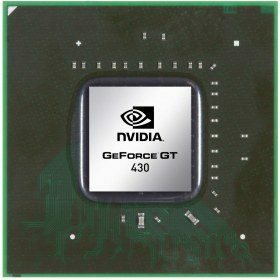 The hardware continues to be held back by the current drivers however, with no updates since our look at the GTS 450; I am disappointed that NVIDIA seems more focused on launching an expanded hardware lineup than fixing the experience for the home theater enthusiast. Hopefully NVIDIA has put this time-to-market advantage to good use because Q1 2011 will be an exciting time for the HTPC as alternatives become available. Thanks to NVIDIA for providing the review sample. I have EVGA’s GT 430 and have been extremely happy with it. I’m hoping a future driver will improve some aspects but even without the cards offers a good feature set and stable performance. 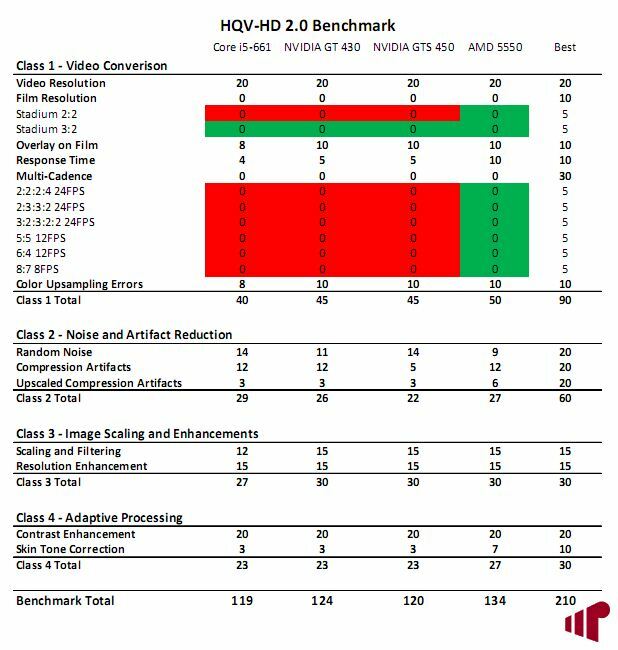 The ATI has the highest video quality measured by HQV-HD but in real movie playback it isn’t a noticable factor for me. The ATI is a great card, they are all; however, I prefer the NVIDIA for the driver stability. With ATI cards I almost expect to rollback to a previous driver revision. Its been a long time since I’ve had to rollback a NVIDIA or Intel driver. Maybe I’m getting old and grumpy but I’m putting more and more value into having to tinker with drivers less. At least on my primary HTPC. I’ve never tested a 5570, I expect that everything 5550+ would perform very similarly to it for HTPC use. Driver/CCC stability is an issue with AMD GPUs, and the main reason I stopped using them in my production HTPC. That said, NVIDIA has some work to do in this case as well (although probably not as much from the sounds of it) so it’s hard to recommend a straight replacement; on the other hand if you were building a new HTPC, or looking to upgrade from a 4×00 card I would recommend a GT 430. It does, thanks. 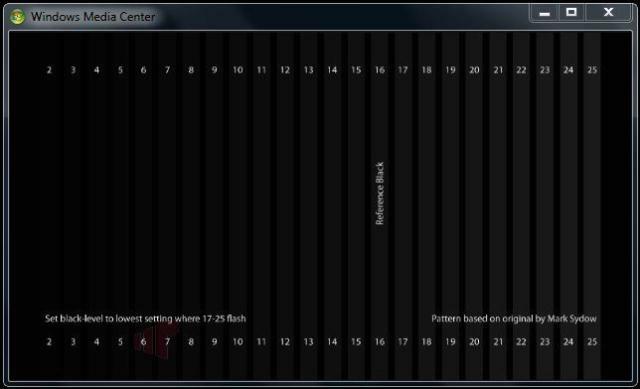 As I said, I can’t get ccc to remember my settings so my pq is awful unless I adjust it every time I watch tv. I’ll wait until I see what Sandy Bridge brings. Thanks again for the info. I purchased the Asus ENGT430 for a recent build for a work computer. The machine had been very stable for over a month, but about three weeks ago I began having with the computer randomly locking up/freezing. I never fully debugged the issue, but I was worried that it might be the 430. The temps ran high (idling in the low 50’s and frequently hitting the 70’s without stressing it much). I ran across a couple of threads(this is an example) at the Nvidia forums where people were reporting similar issues in the 4xx based cards. It was cheaper for me to just replace the card than chase down the problem, so I put in an ATI 5770. So far, I the machine appears to be stable again. Its entirely possible that I got a bad card, as there are many happy owners and glowing reviews like Andy’s. I just wanted to chime in with my experience. I replaced an AMD 5450 card w/ a GT 430 back in October to resolve a brightness flashing issue with live and recorded TV. But now I am quite dissapointed with the GT 430’s de-interlacing of SD material, both live TV and from ripped DVDs. I have the “inverse telicine” box checked and can’t find many options to set at all. Have I missed something in the NVidia set up? Yep, I was told that that’s the only option for de-interlacing. Check the box, and either the card can do advanced deinterlacing or it can’t. I was told there are no options like Radeons have such as Vector Adaptive, etc. I bought a 430 a while back to replace a 2600xt so that I could watch 3D blurays. While that worked, for some reason my recordings and live TV had some kind of annoying stutter. I tried all kinds of settings and nothing got rid of it. So I put the 2600xt back and eventually got a 6570. I still would prefer the 2600xt, but it can’t do 3D and I’m tired of changing out. I’d like to try a 520GT, but I’m afraid the stutter will show up again. However I’m fed up with the 6570’s Netflix performance and I am getting some kind of craziness with my recordings where sometimes the video will look all “smeary” and then sometimes the same video will look OK.
Hmmm… I wonder if I should go back to another AMD card. Other than the Netflix issues (I don’t have Netflix) how is the performance of the 6000 series card?? I would prolly go for a lower end passively cooled model. As for the “smeary” look, I noticed that on some of my SD material as well. The issue was coming from one of the image enhancement settings, “grain reduction” I think. Some how it got turned up past 40. I brought it down to around 10 and that cleared up that issue. The 6570 has been good for DVD and bluray. My antenna pre-amp has been out for a while so I have not been able to receive OTA signals. So I’ve had to record from satellite through s-video since I’ve had the 6570. When things are right, even the SD recordings look very good. What I don’t understand is why sometimes it’s “smeary” and sometimes it’s not. But I have noticed that sometimes the settings in CCC revert back on their own; for example I’ll set it to Vector Adaptive and then I’ll go back in and look and it has changed to “Automatic”. The Netflix performance is very disappointing as I had really gotten into watching stuff on there right before getting the 6570. Is is so jerky, and it wasn’t with the 2600xt. I know a lot of people have this problem with a lot of different hardware configs. I went with a passively cooled 6570 as my understanding is the 6570 is the lowest card that will do advanced deinterlacing.